Having decided that some Autumn climbing in the sunshine would be a treat after the long damp summer here in the UK we gritted our teeth and booked for Malaga with Ryanair. 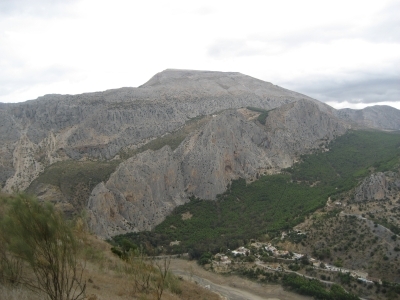 The good thing about Malaga is that excellent climbing can be had in the hills only a 45min drive from the airport. The Rockfax guidebook is very good and gives lots of advice on accomodation, travel etc so we booked a cottage and a hire car and jumped on board a plane at Liverpool. After the initial shock of being issued with cycling shoes by the trolly dolly, I mean this is a cheap flight but peddaling? (just joking). 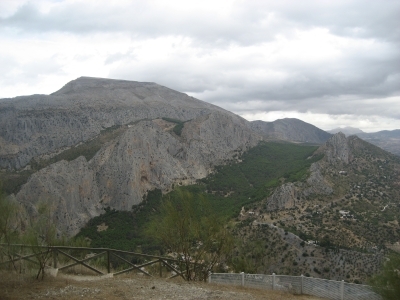 We were soon stepping out into the rain of Spain, picking up the car, shopping and doing some scary driving on the slippery roads eventually arriving safely at our destination of El Chorro. Bright sunshine awoke us the following morning and we climbed at Valle de Abdalajis a south facing crag having a good selection of grades 4 & 5 ie easy ones for us please! Over the week we enjoyed excellent climbing at various sectors of the Escalera Arabe and Frontales crags as well as a revisit to Valle de Abdalajis. All the crags we visited were south facing and at this time of the year are for the most part bathed in lovely warm sunshine. We soon realised why the locals carry umberellas on their evening walk as sudden downpours can on occasion happen, we were once caught in a five minute shower and the crag was dry again after twenty minutes. The few other folks we encounted were from France, Germany, USA, Chorley, Preston, Kendal etc but all in all it seemed very quiet. The rock we were on was very well boted and by our standards hardly polished. Access to the crags is easy althogh a car was needed for our trip to Valle de Abdalajis and for a lovely drive up the Valle de Mijas for fantastic views of the crags and around to Alora. Notes: Everyone was using the Rockfax Guide. 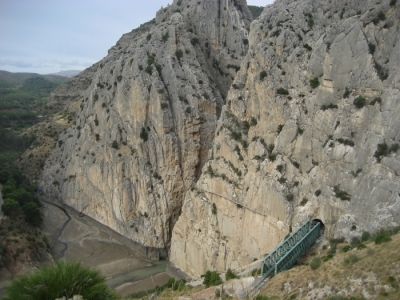 You could avoid renting a car by accessing El Chorro by train and easily spend a week walking in to the local crags. Local talk is that use of the tunnels is still being done without problems. The days were warm ie vest and light trousers or even shorts for those with hary legs. Evenings were chilly needing fleece and for the last few propane heater in the cottage. Campsite seemed to have closed up weekend of our arrival. Shop for most of your needs n the outskirts of Malaga although threr are a couple of basic shops in El Chorro. We didnt eat out much but the village has a restaraunt and bars which seed to be quite nice. For non climbers there are some very nice local walks and lots of potential for ATB's. A brilliant week in a lovely place, good chill out and very good climbing. Oh and the brandy!